This 120 Piece Food Set has everything you need to create your own mini supermarket or the perfect accessory for your play kitchen. From Bananas to Pizzas and Cherry Pie to French fries, this 120 piece pretend food play set helps children enjoy and explore the world of food. 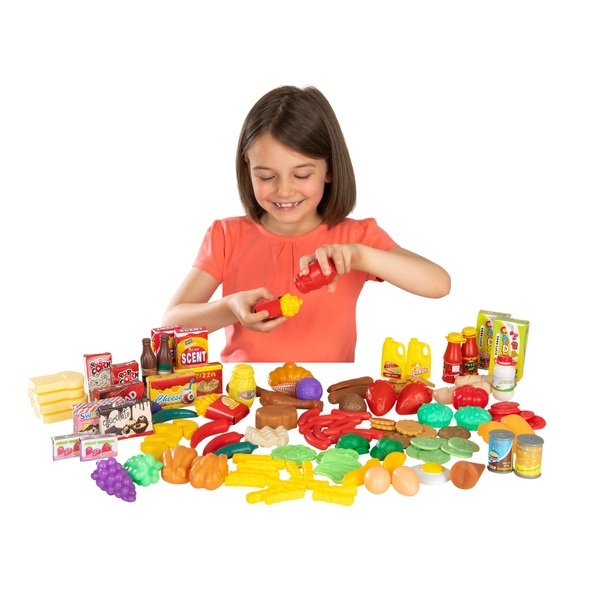 The faux food set comes with 120 colorful plastic pieces that include green vegetables, meat, fruits, and dairy products that can be used alone or added to one of several high-quality toy kitchens for hours of active play. This play food set can even help children make and understand good nutritional choices by familiarising them with basic food groups. Both fun and educational, this pretend food play set is an excellent complement to any toy kitchen or supermarket. Bring it home today!! Colours and styles may vary. EU Warning: Not suitable for children under 3 years of age. Small parts; choking hazard.